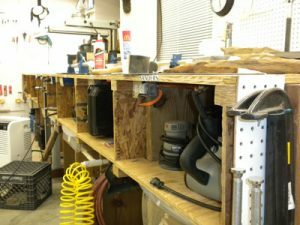 When I set out to build a sharpening center, I started with specific goals in mind. First, I wanted to be able to take it to the work. If I were hand-cutting mortises and tenons at the saw table (I don’t have what one would actually call a “bench”), I didn’t want to walk to the other side of the shop for a touch-up on a chisel blade. What passes for a “bench” for me is some plywood screwed to wooden I-joists called McMillan TrusJoists. Very flat. Very sturdy. A little short on looks. Second, I wanted it to be completely self-contained. For me, that meant a place to store waterstones, chisels, and water. And, of course, being a Jim Randolph project, I wanted it to be cheap. I took some spruce 2x4s I already had sitting in the wood storage and built a frame to a comfortable height. I put some X-bracing in the bottom for stability and strength. The top was made from a hollow-core door I got out of someone’s trash. 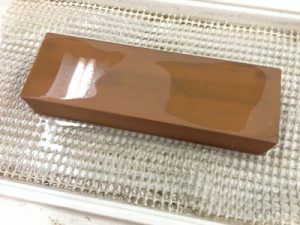 It had the combined advantages of being very flat and covered in a plastic that would help it shed water from the sharpening process. It needed to be considerably stiffer, so I attached more spruce with Gorilla Glue (polyurethane adhesive). That gave me plenty of strength in the attachment without having to use any fasteners from the top, and it doubled as a top member of the frame, too. 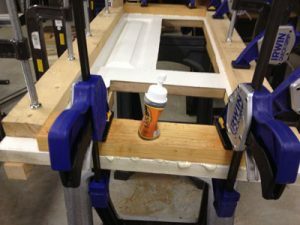 Gorilla Glue has some limitations, especially in projects where you don’t want it all over everything. Here, it was easy to hide the overflow and the strength of the bond between the plastic door covering and the spruce is unquestionable. 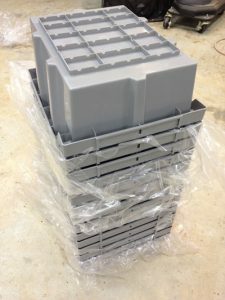 My wife’s art studio has some rolling shelving that came with grey plastic bins. She used only about half of them and the others are stacked neatly in her tile studio. She has given me carte blanche to use as many as I like, so I cut a hole in the top to drop in a bin/water tank. While this looks like more bins than anyone can ever use, the stack used to be twice this tall. As you know, sharpening yields a lot of swarf, so the water container had to be removable for easy rinsing and water changes. Swarf collects, along with minerals from water. 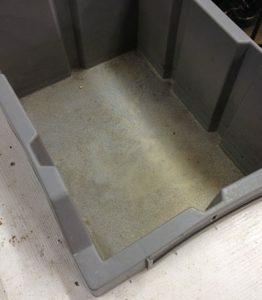 Being able to remove the water-holding bin makes cleanup and refilling a snap. Waterstones soak here. I like my waterstones to sit in water while I’m sharpening. Doing so allows them to absorb more water and gives easy access to a bit of water to dip the chisel in while sharpening. Still, this container needs to be shallow enough that one’s hands are free of interference while stroking. On my way to work one morning I spied a timber on the side of the interstate. Several days passed before I had time to stop and pick it up, and, in the intervening time, someone beat me to the prize. However, walking along the highway I found three Krispy Kreme “market trays.” Two of them were a little beat up, but one was in pristine shape and made a perfect water tray. For the uninformed, like me, a market tray is the holder that doughnuts sit in while they’re waiting for us to buy and eat them. All I had to do was cut a slot in the sharpening table top and add some non-slip rug backing for the stones to sit on. Thanks to Krispy Kreme, whichever stone is in use can sit in a water bath, shallow enough that the lip doesn’t interfere with one’s hands while sharpening. As this was going to be a “wet location,” I put plenty of primer and white paint on all of the parts as I assembled. A set of nice, big wheels makes it easy to move around the shop, even if sawdust and shavings are still on the floor. 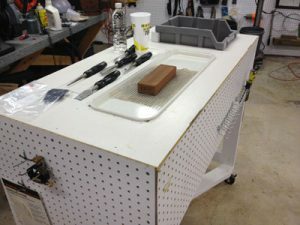 White pegboard around three sides allows me to keep chisels, stones, a flat sheet of glass and other sharpening needs handy. Everything is in one place. Water, waterstones, and all the grits needed to take a chisel or plane iron from dull to scary sharp. I thought about mounting a grinder on here, but there simply wasn’t enough room, and I worried the mix of water and electricity might not be wise. The Ziploc bag holds an oil rag (old sock) for wiping chisels after sharpening and before storage. The water bottle is marked with a skull and crossbones to prevent anyone from drinking the stale water it holds.